We are a young team that loves the mountains and everything related to them. Our goal is to ensure that the great beauty of the mountains becomes accessible to you. We are aided in this quest by our collective years of experience with mountaineering in the Tian Shan mountains ranges and various outdoor adventures throughout the Almaty region. Having diligently studied our native region over the course of 20 years, in 2015 we began to organize commercial tours in various forms of active tourism: single and multi day treks, alpinism and scaling peaks, cycling, extreme winter sports (including freeride and backcountry), road trips and expeditions. Additionally, we also work in neighboring areas: South Kazakhstan region (near the city of Shymkent) and in Kyrgyzstan (around the lake Issyk-Kul). We also continue to find time for our own independent excursions, studying new routes and mountain regions of Kazakhstan. Notes about our own travels can be found on the blog we’ve kept since 2014. More stories on the russian version of the our website. WINTER we spend in the mountains, skiing and leading groups on one-day treks. SPRING we move away from the avalanche-prone mountain slopes to the colorfully blooming planes. Until the beginning of summer, we recommend bicycle tours and automobile excursions through the national parks of Altyn-Emel and Charyn. SUMMER we spend primarily in the mountains, going on multi-day trekking of various levels of difficulty, ranging from simple treks to scaling mountain peaks that exceeds 4000 meters in height. The beginning of AUTUMN keeps us in the mountains. September is the golden time for that. But later, our guides feel some accumulated exhaustion while the tourists begin to experience the fall blues. Thus that part of the season until winter tends to not be heavily booked, although one could certainly ride bicycles, plan automobile excursions, and go on one-day treks. I will now share some more detailed information about the types of tours that can be organized from Almaty, and the specifics of how we lead them. On this page these services are divided into several categories: autotours, mountaineering, backcountry, and so forth. One-day treks – usually these are are simple treks in good mountain trails near Almaty. We deliver you to the beginning of the route on an automobile, and then walk on foot into the mountains of the Trans-Ili Alatau. For tourists the most important requirement is good shoes and a backpack with warm clothes, food and water. Should you choose a trek to a glacier or moraine lakes, then it is necessary to take with you warm clothing, even in the summer when at any point the temperature can radically drop and snowfall can begin. All the treks are interesting, but be sure to carefully look at the length of the tours and choose the one that fits your ability, in addition to noting its seasonality. Some of the most beautiful places are the mountains lakes (Big Almaty Lake), waterfalls (Butakovskiy Waterfall), glaciers (Tuyuksu Glacier and Bogdanovich Glacier), as well as the panoramic and scenic routes Kumbelsu Pass and Panorama of the Tien Shan Mountains. Hike Ascents – these are treks to the peaks of Northern Tian Shan at the altitude of 3000 meters and higher. They specifically do not involve climbing or the use of specialized equipment. These treks are designed for more experienced tourists. Firstly, the gear needs to be of higher quality. This is especially true for mountain boots (here sneakers will no longer suffice). Secondly, the ascent to the top is varied. Due to the long hike, the tourist can get tired. If the trek is short, then we would ascend by car to high altitude rapidly. Here certain individuals may experience altitude sickness, although many others do not, and can readily scale the mountain. This happens particularly on the Tourist and the Big Almaty peaks, where the trek begins from the height of 3300 meters. We recommend that you take with you tea with lemon and vitamin C, being sure to drink plenty of water. Thirdly, there may be issues with paths. Good paths exist only on the peaks of Firmanova, Panorama, Three Brothers, Kumbel, Bukreev and Rahat. The rest have to generally be scaled without clear trails. Ascents to popular peaks, like the Tourist and Big Almaty peaks (these are the highest mountains with the shortest hikes), are complicated by steep slopes with loose ground. 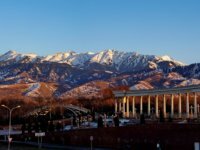 Although the big Almaty peak has a fairly good trail, the hike can still cause certain challenges for the inexperienced tourist. This is all individual-specific and is hard to predict. If you want to combine an auto excursion and a trek to the mountains, then be sure to choose a trip in the Asy Plateau region, to one of the peaks that are over 3400 meters. Although there are no trails here, the absence of steep slopes and loose ground makes the ascent quite pleasant, while the surrounding views are simply magical. Additionally, we are happy to develop custom tours. 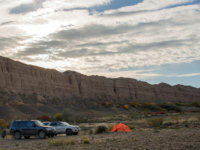 For instance, we could combine a simple hike with a mountain ascent or a mountain trek with an automobile excursion, for instance, in the Charyn canyon. Trekkings are usually ordered by experienced tourists, more rarely – novices. We try to ensure that the trekking is performed with maximum comfort, including cooking food, setting up tents, and renting equipment. The main load is carried by the guide, and if the group is large, then also by his helper(s). Usually this is group equipment: tents and cooking utensils. Food is distributed among all participants: men carry a bit more, women a bit less. Additionally, each participant carries their own equipment, the list for which is included at the end of the description of every program. For short treks for 2-3 days a tourist’s backpack typically weighs 10-12 kilos. The end result is a tour that is “all inclusive,” with no additional costs incurred. The trek starts from your “homebase” (the hotel), from which we pick you up, and where we later drop you off. We adhere to these principles in other categories of tours with novices. We also offer additional options in the form of rented sleeping bags and the services of porters to transport the loads. Winter trekking – the primary season for trekking tours around Almaty starts in June and ends in September, with the exception of two routes in Turgen. In wintertime we have the option of trekking with overnight stays in mountain hut for 2-3 days. This program can be extended to 5-6 days. In every category there are tours that are marked with «+» — these are trekkings that utilize specialized alpine equipment. These are the same mountain treks that were particularly popular with Soviet tourist sportsmen. These tours are as difficult as alpine ascents. Treks to peaks of 4000 meters – ascents to mountain peaks of Trans-Ili Alatau that are at an altitude of 4000 meters and higher. This is a type of trekking to the top without the use of specialized equipment. All these peaks are located around the city of Almaty and tours take 2-3 days. Where else in the world can you have the opportunity to climb a 4000-meter in just a couple of days? We also offer longer programs («trekking+ascent») Recommended for more experienced trekkers. The most popular ascents are to the Molodejniy peak (4147 meters) and the Sovetov peak (4317 meters). The highest peaks from this category of tours is Kokbulak (4555 meters) and Molodaya Gvardiya (4398 meters). The ascents take 3 days. The final portions require the use of certain specialized equipment. There is no climbing on these routes, just walking ascents. For the tours in this category, we do not recommend that you begin the trek immediately upon arrival by plane, as it is preferable to spend one day in the city or to acclimate by visiting Medeo and Chimbulak. The principles for organizing these tours are the same as for trekking. Mountaineering – this entails ascending mountain peaks that are at a height of 4000 meters and greater with the use of specialized alpine equipment. Certain ascents do not require special preparation from tourists, we can explain and demonstrate during the tour. If you do not have experience with alpinism, then you can choose the following routes: Molodejniy peak, Sovetov peak, Locomotiv peak, Zhastar peak, Muryntau peak or Abalakova peak. The latter 2 tours last 6 days and pass through the picturesque valleys of the left Talgar. The former 2 mountains you can ascend in 2 days, thus they are great weekend tours. — Western Tian Shan (Sayram peak 4238 meters, 5 days). We hope that in the future the program “Highest Peaks of Kazakhstan” will grow to include the peaks of Beluha 4506 meters (Altay) and one little known peak in the mountains of the Kyrgyz Alatau that’s 4300 meters (Merke gorge). The hardest one is the ascent to the Talgar peak, while the easiest is to the Sayram peak. The organization of these programs is similar to that of other tours. The package includes rental of alpine equipment, and an additional guide in the event of large groups (1 guide per 1-2 tourists). 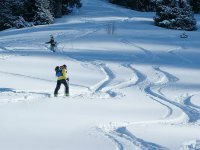 Skitouring wintertime and springtime (backcountry, freeride) – these are one-day treks in the vicinity of Almaty in wintertime that include a descent on skis or a snowboard down the wild hills of Tian Shan, i.e. riding without a formal route. The ascent is either on foot or by skitour (splitboard). We provide the transportation and a guide, who will safely lead you on the route from the ascent to the end of the ride down. If you don’t like skitour, you can choose ski resort tours. Bicycle tours (velotours) – multi-day treks on bicycles through varied terrain that are accompanied by an automobile, which allow the tourist to travel light. Every year for the Nauryz holiday (5 days of vacation in Kazakhstan in late March) we organize bike tours through the vast steppes around 200-300 kilometers from the city of Almaty. On our site we present a few 5-day program for individual purchase. Road trips| Tours through national parks – one-day or multi-day trips by car that introduce you to the nature and history of Semirechye. These are particularly well suited for those who do not enjoy long hikes but would like to escape from the city bustle, capturing outstanding images of the breathtaking beauty of the Almaty region. The organization of these tours is straightforward – we travel on a 4-wheel drive vehicle and stop at or stroll in the most interesting and appealing spots. You can set the length of these walks yourself, though they typically last 20 minutes to an hour. Should you order a multi-day tour, we will provide tents. If you prefer to spend the night in more comfortable accommodations, then you can pay to stay in a guest house or a hotel. The cost per person for more comfortable accommodations can range from 10-15 to 25-30 USD per night. Please let us know this preference ahead of time, as certain spaces may not have suitable accommodations or they may fill up quickly in the summer. Generally speaking, staying in tents is more practical, since you can stop in any suitable spot. The autotour programs through the Almaty regions are planned with this option in mind. So why should you visit the Tian Shan mountains? Tian Shan — they are the Alps as they were 200 years ago, just as wild and untouched by man. There are no mountain lodges, no roads. Oftentimes the routes we take lack paths. During your trip you can visit all the climate zones, from deserts and steps to taiga forests and arctic ice! There is a large city near the mountains. Just 30-40 minutes by car and we are on a mountain adventure! Our routes do not have a large number of tourists, and oftentimes we do not meet a single person over the course of 5-10 days! With us you can find a trip for any taste and of various levels of difficulty, from simple walks in the mountains to ascents to peaks of up to 5000 meters! Ride a bike or an automobile through the vast steppes of Kazakhstan and ski down the virgin snowy mountain hills! If you have any questions or would like to order a tour, please write to us by email or via WhatsApp, or give us a phone call. All the contact information is listed at the bottom of this page. We will help you reach the greatest peaks of your life!